Photo by Human Rights Information Center. Master class from Sean Devlin at Docudays UA. Sean offered the audience the general principles of planning actions. To illustrate, he cited the examples of environmental interventions, but this algorithm can be used for any human rights activities. The aim of the campaign is to force whoever is targeted to demonstrate the reaction in the public space. In addition, the action should be prepared so that the politician, official or owner of the Corporation, showing the reaction had to choose between bad and worse. That is, the target should in any case obtain publicity. According to this principle, the Yes Men staged an action at the press conference of the Prime Minister of Canada, who gave permission to increase production of oil in the ocean, despite the violation of ecosystems and dangerous impact on climate change. "The Prime Minister has the most expensive protection. But we bought the costumes of the waiters in a pawnshop, and in the guise of waiters past the guards and under the guise of waiters came on stage to the Prime Minister, to give him water. We pulled out a poster with the words "Climate change". We were detained by security. But the event resulted in headlines like "That's the way Canada responds to climate change". So, we forced our target to respond. But in this situation, any reaction was not good for it. In this case they removed us, and if allowed to remain, we would publicly have reported information about the dangers of oil production. So, during the preparation of the action you must always consider how to create such a dilemma for your target," said Sean Devlin. Sean told how the Yes Lab plans actions. First and foremost, a place of action or place of intervention is chosen. They are divided such places into 6 types. This is the place where is the source of the problem. This can be the place of oil extraction, plant for the production of something harmful, etc. This is the place where a harmful product or a product of a bad production is sold and where customer loyalty is expected. In the case of the Shell Corporation, it is the gas station. Sean remembered about the Greenpeace campaign, when activists dressed as polar bears, blockaded the Shell gas station. 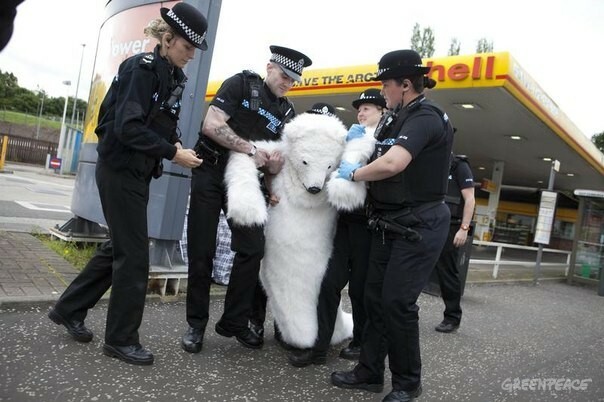 So the police had to detain... polar bears. This is the place where the greatest harm from a product or production is done. 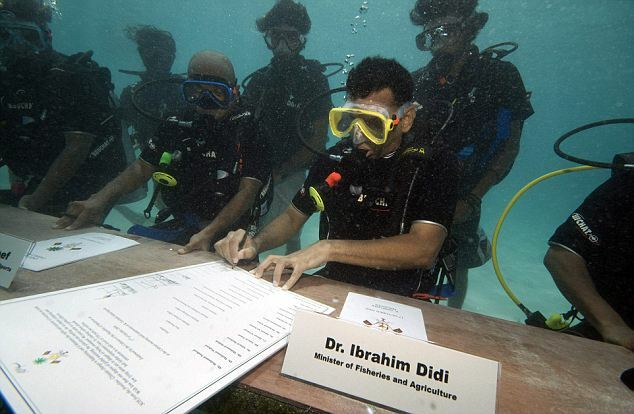 A striking example of action at the point of destruction, according to Sean, is the meeting of the Cabinet of Ministers of the Maldives in 2009, held under water in scuba gear. The meeting was to draw attention to the increase in global sea level. It is not a physical place, but a place where people are under pressure of propaganda or advertising. It can also be an event where politicians say that all is good when it is not. Sean Devlin spoke about the Yes Lab action concerning the oil spill on the coast of Canada. The authorities held a news conference to declare that there is no pollution and everything is clean. At the same time, the activists gave them the oil-polluted objects found on the shore and asked to touch. This is a place or event, which provides a large audience and a large amount of attention. Then Sean reminded about the intervention of Greenpeace at the ceremony of awarding the Formula 1 winners, sponsored by Shell. Activists managed to get to the place of the ceremony and to place a banner next to the Shell stating that the oil industry is harming the Antarctic. In addition, at the time of the ceremony, when all eyes and cameras were focused on the podium, in front of the podium RC banners about saving the Antarctic appeared, which "ran away" from the guards who tried to remove them. A place where a decision is made to affect the problem. Sean Devlin showed the slide of the hall of the Verkhovna Rada of Ukraine, immediately adding that this is just a formal place in decision-making. In fact, in his opinion, the cases are solved in offices, hotels and other informal venues. Listeners of the master class presented simple and bright ideas. Among them were fake web sites to combat a chaotic and harmful development in the city, the gratitude of people in wheelchairs for overhead crossings, fake news to combat manipulation in the media, etc. *The video is attached to the article.